We taped a wonderful show this past weekend at the Arie Crown Theater in Chicago, Illinois. 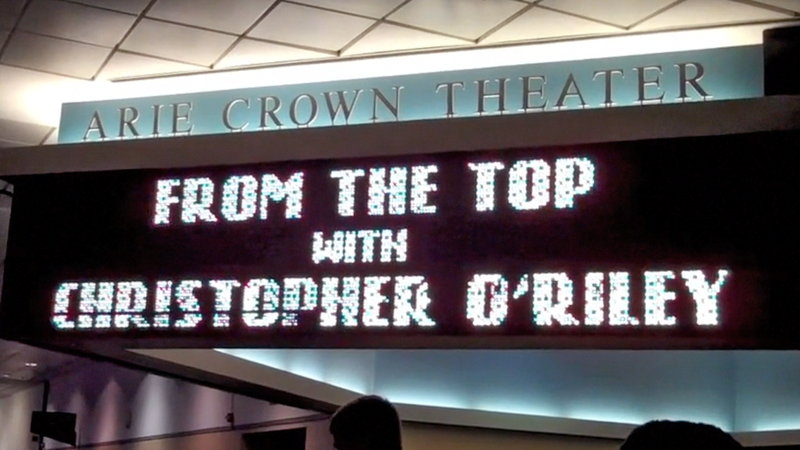 It was a special show for all of us at From the Top because it kicked off our 12th taping season! It was also special because the taping took place at the National Education Association convention before an audience of 2500 enthusiastic educators. What a generous audience they were! All of the young musicians featured on the show were public school students, and each gave a shout-out to an important teacher in their lives. The musical performances, as usual, were terrific. Opening the show was 17-year-old violist Stephanie Block who showed great expression in her performance of the first movement from Walton’s Viola Concerto. Following Stephanie, 18-year-old baritone Geoffrey Hahn took the stage to beautifully perform “Whither Must I Wander?” from Vaughan Williams’ Songs of Travel. Next, 19-year-old cellist Nikita Annenkov performed Impromptu by Alexander Arutiunian and then told the sweetest prom story ever. This was followed by a teenage septet from the Merit School of Music performing portions of Igor Stravinsky’s “The Soldiers Tale” accompanied by narration from teacher Brayer Teague. The septet’s performance was especially spectacular given the fact that they performed such a difficult piece without a conductor! Closing the show was a truly outstanding 17-year-old pianist named Kate Liu who treated us to a jazzy piece I’d never heard before, a movement from a piano sonata by Israeli composer Avner Dorman – a magnificent end to a memorable show. Enjoy this flipcam montage of some of the performances and backstage antics– and make sure to tune in when this show airs the week of October 31. Until we meet again, happy summer everyone!